12 ESD seniors recently earned the rank of Eagle Scout, many spending the majority of their scouting career together in the same troop. Remarkably, 12 translates to nearly one out of every four boys in the Class of 2019 earning the rank. Comparatively, approximately six percent of all scouts go on to achieve this prestigious honor. Congratulations to Will Beck, Reece Breaux, Trey Brooks, John Carrie, Miles Cavitt, William Greening, Luke Logan, Jackson Mechem, Scott Neuhoff, Cooper Newsom, Luke Stanford, and Christopher Talbot on this amazing honor! In total, these Eagles gave over 1,100 hours of service to the community. Eagle Scout is the highest achievement or rank attainable in the Boy Scouting program of the BoyScouts of America. 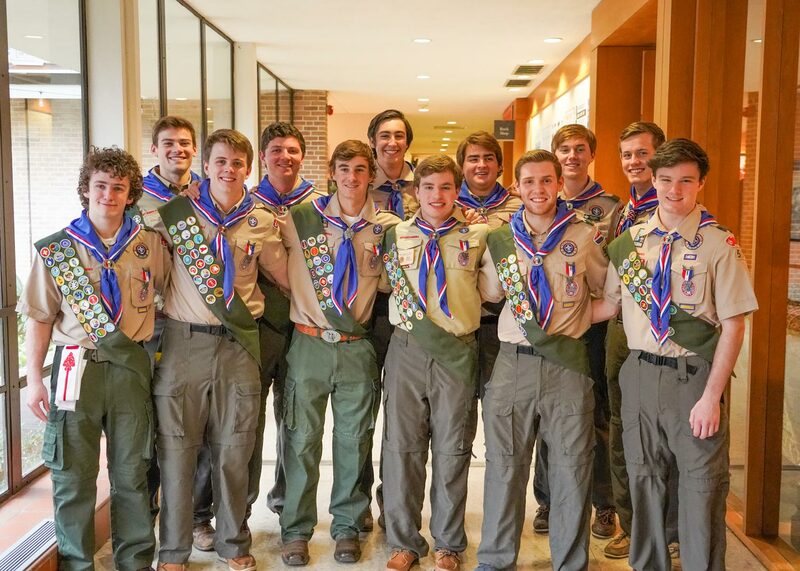 In order to earn the rank of Eagle Scout, these students completed all of the qualifications such as earning a specified number of merit badges, providing references, and completing a service project. Not only are they proficient in skills such as citizenship, swimming, and emergency preparedness, these students are also skilled in building decks, constructing eco-friendly garden boxes, and installing bike repair stations. "During the project, I learned to adapt when things go wrong. The project gave me a chance to use the leadership skills I had learned through my years in scouting," said one Eagle Scout who volunteered at Operation Kindness, the largest no-kill animal shelter in North Texas. "Completing my project had been a goal that I set for myself when I first became a Scout," said another, who volunteered at Cornerstone Crossroads Academy. "The reason I chose the project I did was because cars had been causing damage to the school's sports field and surrounding walking track as well as posing a threat to the students. I'm proud that I was able to combat this issue and make a difference for such a fantastic and deserving school." "It was a very rewarding experience being able to help others by building something with our hands. This experience allowed me to organize and lead my peers which was invaluable to my Boy Scout experience," said another. Congratulations on this outstanding achievement, Eagles! We are so proud of your hard work and dedication.